Delilah has lived out her tempestuous marriage to hell-raiser Raf in the glare of the media spotlight. Now planning a milestone birthday, she has more on her mind than invitations. Raf has been offered a part in a movie he can't refuse. But will he succumb to the temptations he's struggled to resist for the last ten years? Delilah's three daughters are building careers of their own, only too aware that the press are waiting for them to slip up. For the Rafferty girls might look like angels, but they are only human. It's the perfect recipe for a party like no other..."
The Birthday Party is a book about a family who could easily outrun The Osbournes! This book is packed full of unique and vibrant characters with exquisite detail. 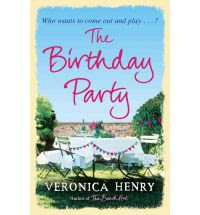 There is quite a bit of jumping about at the beginning but Veronica Henry weaves the characters and their lives together seamlessly to create an enthralling story that you can’t help but get sucked into. It might be a little difficult to relate to the actual lives of the Raffertys but their feelings (in particular their instincts and insecurities) will be easily related to by most readers! On top of all that, there are a few steamy moments buried within this wonderful story. Never heard of this author before but it sounds like a good book.